The defining sound at this year's World Cup -- aside from English groans late in the first half of the U.S.A. match -- has been the constant, mosquito-esque hum of the vuvuzela, a plastic horn common at soccer matches in South Africa. FIFA , the soccer-governing body in charge of the World Cup, is under pressure to ban the noise-maker. It said in a statement that for now it will only outlaw vuvuzelas if they become a physical hazard, such as if fans throw the horns on the field, but that it "continues to evaluate the use of vuvuzelas on an on-going basis." FIFA president Sepp Blatter further clarified the body's position with a Twitter post saying, "To answer all your messages re the Vuvuzelas. I have always said that Africa has a different rhythm, a different sound....I don't see banning the music traditions of fans in their own country. Would you want to see a ban on the fan traditions in your country?" 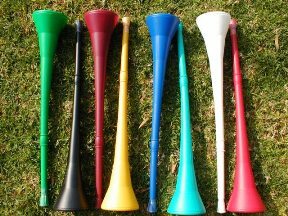 In response to the criticism, South Africa's Johannesburg Star newspaper reports that Masincedane Sport, the company who owns the vuvuzela trademark, plans to offer a quieter version of the horn. "We have modified the mouthpiece, there is now a new vuvuzela which will blow noise that is 20 decibels less than the old one," Neil van Schalkwyk, a partner at Masincedane Sport, told The Star. "We hope to sell these at park and ride areas and public viewing areas." We were curious as to how ESPN and its family of networks is handling the noise on broadcasts. According to an e-mail exchange with spokesman Bill Hofheimer, "We do mix audio for matches, just like we do for other events we cover (i.e., NASCAR races, football game). Our goal is to find the right balance of natural sound while ensuring the calls of our commentators can be heard by fans at home." In other words, it would seem the WWL is providing viewers with a toned-down version of the noise. Fro that, perhaps we should be thankful. Not sure, too, if Minneapolis-St. Paul folks are particularly sensitive to the horns or just not fully enmeshed in World Cup fever, but Hofheimer also provided the local TV ratings for Saturday's USA/England match. The Twin Cities pulled in a 5.9 rating, which was 41st out of 56 measured markets. The average US rating was a 7.3, with San Diego leading the way at 11.5. Consider that the first three NHL finals games on NBC -- which did relatively great numbers compared to previous years -- did a 3.3 rating in the Twin Cities, and do with those numbers what you wish. Monday (England goalkeeper moments) edition: Wha' Happened?